The Chemical Guys Wipe Out Surface Cleanser Spray will help you strip old layers of protection, remove oils, fingerprints, dust, and more quick and easy. Virtually every polish leaves behind some ultra fine layer of oil that is almost impossible to see. The surface may also have dust particles, finger prints, polishing particles and other contaminants naturally found in the air settling on the vehicle. These oils and residues can be very challenging to remove, even with a top quality microfiber towel. Proper surface prep is a critical step to help fresh layers of vehicle coatings, sealant, and wax adhere to the paint properly. Just mist it on the paint and wipe it away with a clean microfiber towel and you will see and feel a squeaky clean shine that you can apply any form of protection on top of. Properly prep the surface to apply any form of protection, check polishing work to ensure no swirl or scratch was hiding underneath polish residue, or simply just clean the surface from light dirt and grime. Wipe-Out is formulated with special lubricating and anti-static agents to help prevent adding new imperfections into the surface during application. 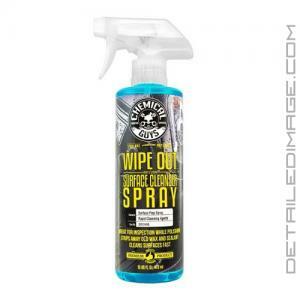 Stop skipping the proper preparation steps, pick up the Chemical Guys Wipe Out Surface Cleanser Spray today! Chemical Guys Wipe-Out is a premium surface-cleansing spray that prepares paintwork for a fresh coat of protection. Protective coatings, sealants and waxes adhere best to totally-clean paintwork. The advanced cleaning formula of Wipe-Out strips old wax, sealant, used polish, oil, and grease to completely expose the surface. During paint correction, used polish can hide unrepaired scratches and swirls. Simply spray Wipe-Out after polishing to remove residue and clearly inspect your work. Wipe-Out prepares the surface for applying fresh glaze, sealant, and wax. The premium spray cleanser will not dry out plastic, rubber, or vinyl surfaces. Prepare your vehicle for a fresh layer of wax or sealant with Chemical Guys Wipe-Out surface cleansing spray. 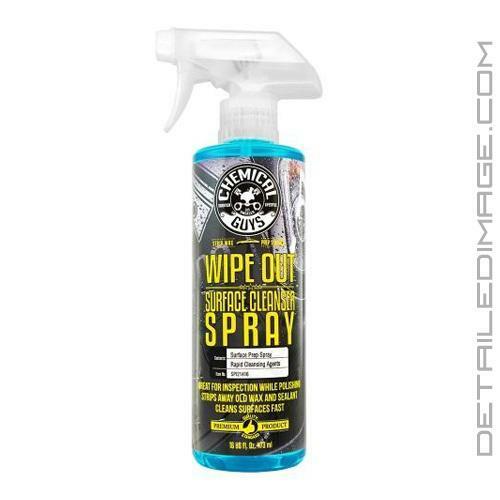 Shake well - Spray Wipe-Out on the desired area - Wipe away in one direction with a premium microfiber towel - Buff off residue and inspect surface for further polishing needs or wax/sealant application. Worked well on Jet Black Nissan with Adams Paint Sealant, and several alternating coats of Opti-Seal, and Collinite 915. Sprayed liberally, waited a few seconds for Wipe Out to start penetrating, and used straight stokes 360GSM MF towel. Surface came very clean, but clayed afterward anyway, then finished with CarPro Eraser to get surface really clean. Wipe Out worked easily, and I did not have to worry about trying to measure out some tiny amount of CG Citrus Wash into a 16oz bottle for just a specific panel. If you have an entire car to strip then fine use Citrus Wash, but if you just have a few panels, then Wipe Out gets the job done and saves time.